Dysplasia, the morphological yardstick of epithelial precursor lesions, is the collective term for a variety of architectural and cytological changes within the altered oral epithelium. Angiogenic squamous dysplasia (ASD), a distinct morphological characteristic in pre-invasive bronchial lesions, describes the presence of capillary tufts that are closely juxtaposed to and projecting into the dysplastic bronchial epithelium. To determine whether ASD-like phenomenon occurs in oral epithelial precursor lesions, and to speculate on its relevance. Twenty cases each of mild, moderate and severe oral dysplasia (inclusive of carcinoma-in-situ), and 10 normal oral mucosa (normal controls) were serial sectioned for H and E staining, and for microvessel density (MVD) scoring with CD31, CD34 and CD105. Microcapillary pattern images were digitally captured for 3-D reconstruction. Oral ASD foci consisting of CD31-and CD34-positive capillary loops abutting onto the overlying dysplastic oral epithelium (and causing it to assume an irregular or papillary surface configuration) were identified in moderate (3/20; 15%) and severe dysplasia (13/20; 65%), but not in normal oral mucosa and mild dysplasia. MVD score demonstrated increasing vascularity as epithelium progressed from normal to severe dysplasia (p < 0.05). CD105 demonstrated increase neovascularization in all dysplasia grades (p < 0.05). These preliminary findings taken together suggest that: 1. ASD-like phenomenon may be an important intermediary biomarker in oral precursor lesions; and 2. architectural alterations of the entire disturbed mucosa may be a more useful pre-malignancy index. Angiogenesis is defined as the growth and proliferation of blood vessels from the existing vasculature . It is a multistep process that is mediated by vascular endothelial cells and involves the response of existing vasculature to a series of protein mediators. Angiogenic squamous dysplasia (ASD), a qualitative distinct form of angiogenesis, was first described in pre-invasive bronchial mucosa of high-risk individuals . It is characterized histologically by the presence of capillary tufts that are closely juxtaposed to and projecting into the dysplastic bronchial epithelium [3–5]. The concept that oral carcinogenesis is a two-step process characterized by the initial presence of a precursor lesion that subsequently developed into cancer is well-established [6–8]. According to the World Health Organization (WHO), a precursor lesion is defined as "altered epithelium with an increased likelihood for progression to squamous cell carcinoma" . The altered epithelium is characterized by a variety of cytological and architectural changes collectively grouped under the term dysplasia [6, 8]. Research has shown that a significant increase in vascularity occurs during transition form normal oral mucosa through different grades of dysplasia to invasive carcinoma [9–11]. However it is not known whether ASD-like phenomenon occurs in these oral epithelial precursor lesions. The aim of this study is to examine the mucosal papillary connective tissues of oral epithelial precursor lesions for these characteristic capillary tufts and to speculate on their relevance. Three endothelial markers namely CD31, CD34 and CD105 were used in the immunohistochemical detection of angiogenic activity. CD31 and CD34 are panendothelial markers whereas CD105 is a marker for neoangiogenesis. A total of 70 formalin-fixed, paraffin-embedded specimens were selected from the archives of the Department of Oral Pathology, Oral Medicine and Periodontology, Faculty of Dentistry, University Malaya, and Unit of Stomatology, Cancer Research Centre, Institute for Medical Research, Kuala Lumpur, Malaysia. The patients' characteristics are summarized in Table 1. Prior ethical approval was obtained, and safety and ethical guidelines were followed in using these human tissues according to the requirements of the institutions. The selected specimens consisted of 10 normal oral mucosa and 60 dysplasia cases (mild = 20, moderate = 20, severe = 20) where severe dysplasia was used synonymously with carcinoma-in-situ. They were selected on the basis of the recorded original diagnosis. Following selection, new sections were prepared and stained, and the diagnoses were re-evaluated. The inclusion criteria for the selection of specimens with dysplasia are lesions clinically diagnosed as leukoplakia, erythroplakia, or simply white or red patch. The exclusion criteria are specimens from patients with a previous history or presence of any carcinomatous lesion. Specimens from potentially malignant oral conditions namely oral lichen planus and oral submucous fibrosis were excluded from this study. Lichen planus was not included on grounds of the controversy that surrounds its status as a potentially malignant oral condition . Oral submucous fibrosis was not included because the progressive fibrosis and hyalinization of the subepithelial connective tissues as observed at the lesional site renders an evaluation of its microvasculature unsuitable. Immunohistochemical staining was performed using the avidin biotinylated complex system (ABComplex/HRP, DAKO, Copenhagen, Denmark). Briefly, deparaffinized 5 μm thick sections were pretreated for antigen retrieval by autoclave heating (99°C) in 10 nM of citrate buffer (pH 6, 20 min). These sections were then immersed in 0.3% methanol containing 1% hydrogen peroxide for 20 min, to block endogenous peroxidase, and rinsed in 0.05 M Tris-buffered saline (TBS) (5 min, three times) before immersing in 20% rabbit serum (DAKO) for 30 min at room temperature to block non-specific conjugation. The sections were then incubated with primary antibody against CD31 (mouse monoclonal anti-CD31, JC70A, DAKO, diluted 1: 20) for 1 h, CD34 (mouse monoclonal anti CD34, QBEND10, DAKO, diluted 1: 50) for 1 h, and against CD105 (mouse monoclonal anti-CD105, Endoglin, SN6h, DAKO, diluted 1: 20) for 2 h. Sections were then incubated with biotinylated rabbit anti-mouse immunoglobulins (DAKO, diluted 1: 300) for 30 min followed by ABComplex/HRP (DAKO, diluted 1: 1: 100) for 30 min. The antigenicsites were visualized with 3, 3'-diaminobenzidine-tetrahydrochloride, and then lightly counterstained with Mayer's hematoxylin before mounting. For negative control, sections were treated as above but without the primary antibody. All the control sections were negative. For positive staining control, internal staining controls present in the specimens were checked for appropriate reactions with the primary antibody. The established criteria for the identification of ASD were applied [2–5]. Slides were systematically evaluated at low and medium power (x40 and x200) to determine areas in the oral mucosa presenting with ASD-like foci. Serial images of these ASD lesions were digitally captured to determine their 3-D microcapillary patterns. Microvessel density (MVD) assessment was done as previously described . Each series was quantified by a single trained observer. The quantification protocol was done independently for the test (CD31, CD34 and CD105) and control sections. An Image Analyser (Leica Quantimet® Q500 MC, Cambridge, UK) was used to digitize the microscopic fields. The lesional tissues were initially evaluated at low power (x 40 and × 100) to determine four areas in the connective tissue papillae and lamina propria with the highest vascularization ("hot spots"). MVD counting was performed on these four hot spots at high magnification (x 200, 0.06 mm 2 graticule) without knowledge of patients' details or dysplasia grades. CD31-, CD34-and CD105-positive endothelial cells or clusters of endothelial cells that were separate from adjacent microvessels, or connective tissue elements were regarded as a single countable microvessel. Neither lumen formation nor presence of red blood cells within these lumens was required for cells to be counted as microvessels. Microvessels within areas of inflammation, and histological artefacts were avoided. The arithmetic mean of the MVD score in the 4 chosen fields was calculated for each vascular marker, and was expressed as microvessels per × 200 field. Statistical analysis was performed using Chi-square and Student t test, and level of significance was set at p < 0.05. The results are detailed below and illustrated in Figure 1-2. 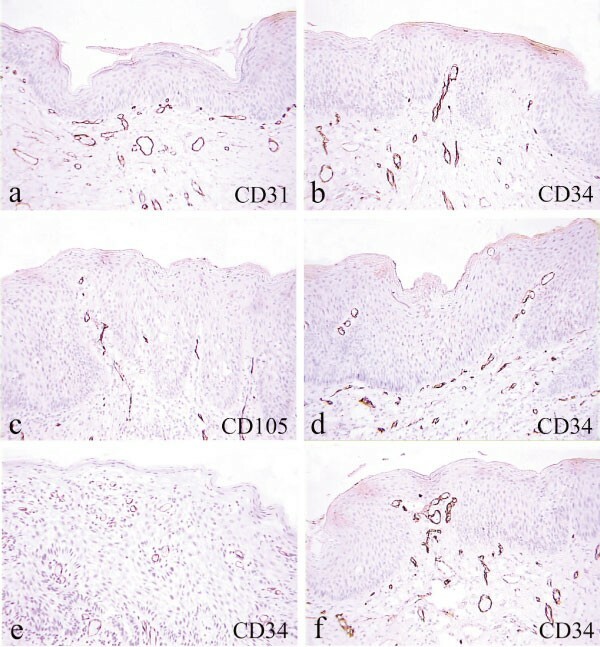 Immunohistochemical results showing stratified squamous epithelium with a corrugated surface (a) and formation of capillary tufts in moderate (b, d) and severe epithelial dysplasia (e, f). Neoangiogenesis is present (c). a-f, × 200. Comparison of microvessel density in normal oral mucosa and in mucosa with mild, moderate and severe epithelial dysplasia. ASD-like foci were observed in parts of moderate (3/20; 15%) and severely dysplastic (13/20; 65%) oral mucosa, but were not evident in normal mucosa and mild dysplasia. These complexes consisted of focal collections of CD31-and CD34-positive, thin-walled, endothelial-lined capillary blood vessels present high up within the mucosal connective tissue papillae, and juxtaposed onto the dysplastic epithelium, causing the latter to assume an irregular or papillary surface configuration (Figures. 1a-f). Mean MVD scores were significantly higher in dysplastic than in normal mucosa (Fig 2). A gradual in crease in vascularity score was observed as the oral mucosa progressed from normal to increasing dysplasia grade (p < 0.05). Bronchial dysplasias are believed to be the direct precursors of squamous cell carcinoma of the lung. Recently, a distinct qualitative form of angiogenesis termed 'angiogenic squamous dysplasia' was identified as an important morphological entity in pre-invasive bronchial lesions of the large central airways. This unique lesion of bronchial mucosa is characterized by the presence of capillary blood vessels closely juxtaposed to and projecting into metaplastic or dysplastic squamous bronchial epithelium . There is architectural rearrangement of the capillary microvasculature . The epithelium is thickened, and the epithelial cells are crowded and pleomorphic. Often there is lack of maturation through the full thickness of the epithelium with overcrowding in some areas and spacing in others. The basement membrane is frequently thickened. Serial sections of the capillary projections confirmed that they represent intramucosal capillary loops. The microvessel density score was elevated in comparison to normal bronchial mucosa, but not in comparison to other forms of bronchial hyperplasia or dysplasia. In the oral region, epithelial dysplasias are also believed to frequently precede the development of squamous cell carcinomas . Consequently, there is an unremitting quest for morphological abnormalities that fall short of invasive carcinoma but may indicate initiation of carcinogenesis. All these histological criteria describe morphological changes restricted to the dysplastic epithelium. Other new systems have also evolved to complement the WHO Classification 2005, and these included the novel binary grading system which categorized dysplasias into 'low-risk' and 'highrisk' lesions after numerical assessment of their architectural and cytological changes . 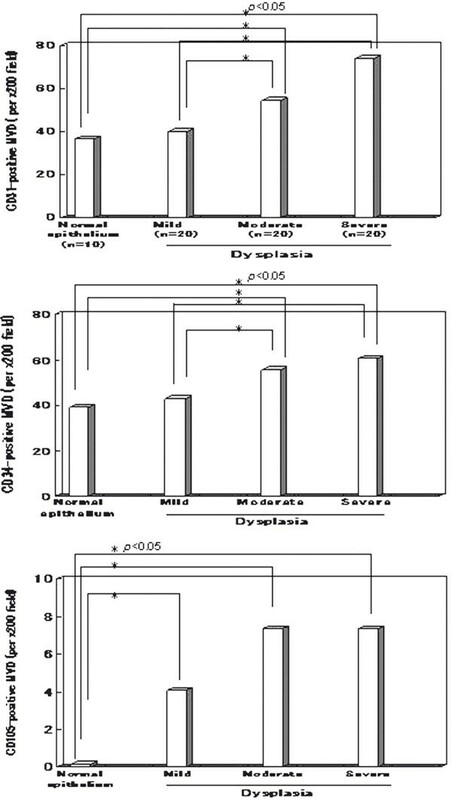 In this study, in addition to the aforementioned morphological characteristics as listed by WHO, we observed that the connective tissue papillae beneath the altered epithelium in moderate and severe dysplasia cases may sometimes demonstrate foci of capillaries that typically formed CD31-and CD34-positive projections or loops that abut onto the overlying dysplastic oral epithelium, causing the latter to assume an irregular or papillary surface configuration. 3-D reconstruction of the microcapillary patterns disclosed that these blood vessels were part of the mucosal microvasculature. Microvessel density score was significantly higher in moderate and severe dysplasia cases compared to mild dysplasia and normal controls. CD105 confirmed the presence of neoangiogenesis. Unlike bronchial ASD which occurs in respiratory-type epithelium, oral ASD was found in keratinized stratified squamous epithelium. The mechanisms underlying the formation of ASD complexes are unknown. The close juxtaposition of capillary tufts to the dysplastic epithelium suggests that an angiogenic stimulus may be associated with epithelial dysplasia in the upper aerodigestive tract. Possible mechanisms of angiogenesis in ASD may involve small populations of dysplastic squamous cells harboring premalignant mutations transmitting angiogenic signals over very short distance. These angiopapillary changes are most likely a consequence of architectural rearrangement of the capillary microvasculature within the oral dysplastic epithelium. In summary, present findings in this preliminary study support the observations: 1. ASD is not unique to bronchial pre-invasive mucosa; and 2. Formation of ASD-like complexes in oral precursor lesions may represent an important intermediate pathological biomarker preceding oral cancer development, and may therefore be useful as a predictive marker of malignancy. However studies on larger samples are needed to clarify this phenomenon further. This study was funded by the University of Malaya Vote F0209/2003A.